Some time back, Rickenbacker visited with the Smithereens in L.A. at the filming of their video, "The House We Used to Live In." This fabled four proved once again that the terms "nice guys" and "rock stars" are not necessarily mutually exclusive. As well as being enormously talented musicians, the Smithereens exhibit a collective class and style in their choice of guitars. As longtime Rickenbacker players they have over the years developed a sound that is creative and unique. This is a sound which sets them apart from the ordinary. 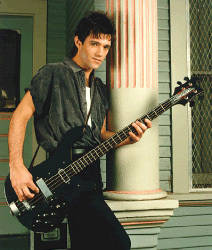 Since Mike Mesaros' bass tones can be heard all the way through the stratosphere, Rickenbacker thought "Blackstar" would be a suitable name for Mike Mesaros' bass of choice. The Blackstar offered the same flawless American made construction of the Rickenbacker 4003S bass series and is especially notable for its brilliant, ebony black, maple fingerboard. Other features included "pin dot" fret markers, solid black knobs, reverse chrome and black hardware, decorative chrome screws and raised letter name plate. Rickenbacker made only 200 of the Blackstar basses.